WE HAVE BEEN WORKING WITH THE MAGIC FOR TWENTY YEARS! YAHOO. Follow my mandala creations, adventures and more! Mandala magic is More than just pretty pictures. 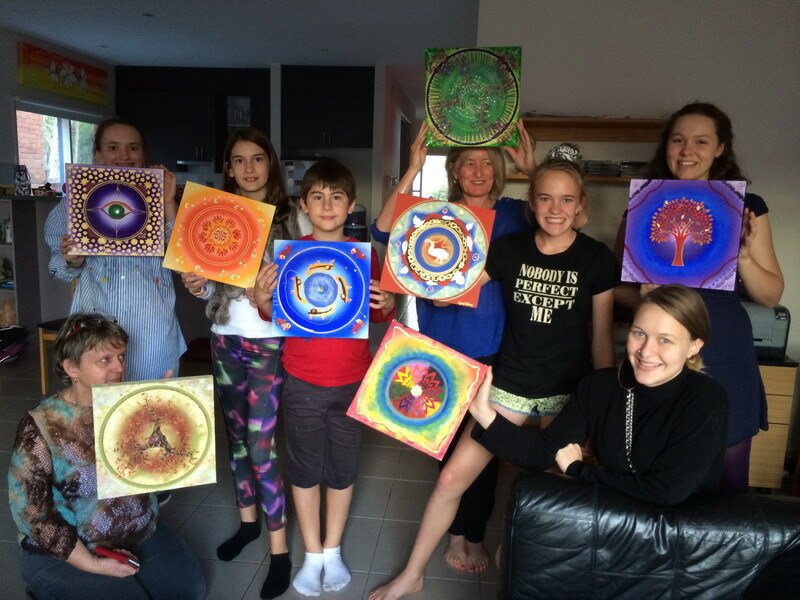 Creativity is a way of being 'you' and Mandala Magic encourages and supports you to leave the spaces that you are comfortable in to step into the wilderness of your intuition and create. What you will discover is wonderful, awesome. We believe that within everyone is a limitless creative potential; that we are connected to a vast sea of universal intelligence and we seek ways to connect with it. We offer creative experiences to find that connection. It has been said that the creating a mandala is making a special space for the process of transforming suffering and hardship into happiness. Enjoy these shared mandalas and the joy that each creator has experienced. Magic! In everyone there lives an artist. I have seen positive changes and magical shifts not only in my life but in the lives of the thousands of people that I have taught, listened to, encouraged and shared the creative art process with. I know that art is a valuable and easily accessible tool. Art is a creative focus that cultivates mindfulness, self-awareness, and stress relief. I believe that creating mandalas helps us to make changes in our lives and can assist in resolving past traumas and current conflicts. These interesting circular forms are symbolic pictures that seem to resonate with our personal search for wellbeing and healing. Every line, shape, image and colour is significant in expressing our individual journeys towards wholeness. At 16 I spontaneously started creating art in circles from random patterns and shapes that just emerged. I thought that I had discovered something magical. Later I learned that others had done much the same during periods of transformation in their lives including Carl Jung a pioneer of psychology. My first painted mandala reminds me of my own ability to create and therefore support myself through life transitions. I have been teaching mandala art for 20 years and called this process - Mandala Magic.